Legwarmers and Knee Pads Now in Stock! 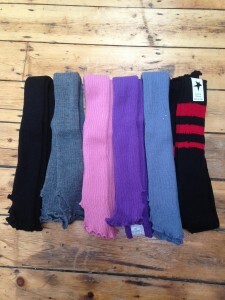 Due to popular demand we have new legwarmer colours in stock (including the mega popular grey ones!) and knee pads for all the Classique dancers. The knee pads are Capezio brand and really squishy - perfect for floorwork and spins that end on the knees. Knee pads come in Medium or Large size and cost £8.50 a pair - cheaper than eBay! Ask your instructor for more details or to purchase a pair - please bear in mind there is no card machine at the studio, so cash only please.